As he arrives with his family at the villa in the hills above Nice, Joe sees a body in the swimming pool. But the girl is very much alive. She is Kitty Finch: a self-proclaimed botanist with green-painted fingernails, walking naked out of the water and into the heart of their holiday. What does she want from them all? And why does Joe’s enigmatic wife allow her to remain? The synopsis above is from the paperback edition that I was bought for Christmas by my Dad. There’s a different synopsis on GoodReads (which I’ve linked to above), which is actually less of a synopsis and more of a mini-review. There are some perfect phrases in that ‘synopsis’ though and it describes Swimming Home as combining “linguistic virtuosity, technical brilliance and a strong sense of what it means to be alive…it wears its darkness lightly”. So accurate are these phrases that I could just end my review right there. On the face of it, this is a quirky tale of a family and their close friends that embark on a holiday in the sun, only to find their tranquility interrupted by the seemingly ever-naked Kitty. Beneath that, there’s so much more. When I was talking to my Dad about this book, he made a point that I would totally love to claim as my own if I didn’t know that he occasionally reads this blog and would call me on it. To him, this was a novel about identity. About a poet who has spent his life struggling to create one for himself out of loss and a disrupted childhood and about a reader who believes that she has found her identity in his writing. According to the very short Afterword in the back of my edition, it’s a novel about “desire: desire and its inseparable flip side, the death drive” and how the worlds of “commerce, politics, marriage and hearth, and literature itself” are affected by both. To that reader, each of characters represents one of those ‘worlds’ and their relationships are at least in part representations of how those worlds interact in modern society and how they can be affected by external sources. Personally, I think that’s a little English Literature A-Level and the kind of analysis that can almost dampen a reading a experience. That said, at only 157 pages, this is the kind of book that you could read a few times and see something different every time. You might think that I’m resorting to others’ comments about this book because I’m either lazy or don’t have any thoughts about it of my own. Really, the point I’m trying to make is that there are so many angles to this book and that I’m pretty sure it will appeal to each reader for a subtly different reason. The characters are complex and it’s remarkable how much detail Levy manages to pack into so few pages. Since it is so short, this is really a snapshot of the characters’ lives and I loved the references to past events that hinted at how each of them have ended up as they are. They aren’t a particularly likeable group but they are fascinating and their foibles do become more understandable (even if not always excusable!) as events play out. 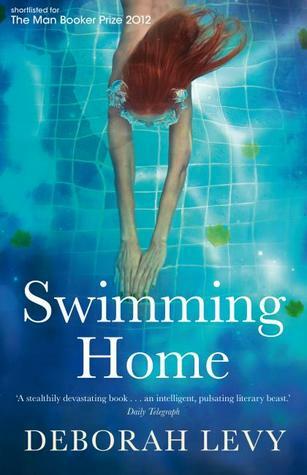 What struck me most while reading Swimming Home was Levy’s depiction of depression and its effects. It’s fairly evident from early on that Kitty has some mental health issues that make her perception of the world quite frightening but fascinating. It was less Kitty’s issues though that captured my attention and more the quiet but equally debilitating depression of other characters, the extent of which was only really apparent to me with the benefit of hindsight. The characters are all facing their own demons, with varying degrees of success, and their journeys are all unique and cleverly woven together. Clearly, the Man Booker prize people knew what they were doing when they shortlisted this one. Definitely recommended. Overall: There is so much to get from this short book that it’s nigh on impossible for me to tell you why you should read it. This would be a perfect book for a book club read because I’m sure that every reader will take something different away from their experience. If you want to take it at face value, it’ll work for that too – it’s also an extremely well-written and entertaining read. Hey, February! Where did you come from?